The Beckett name carries a lot of name in the world of sports cards and collectibles thanks to the publications and price guides that have served the hobby for years. Seeking to lend the value of that name to the card grading business, Beckett Media created Beckett Grading Services (BGS) in 1999, and it has been one of the leaders in its field ever since. BGS has several different grading products, each with its own name and specialty. The normal BGS service handles cards from 1981 to present, while Beckett Vintage Grading (BVG) takes submissions for cards printed prior to that time, with special consideration given to the different printing technology used in that era. Beckett Collectors Club Grading (BCCG) handles high-volume cards quickly and with a simplified grading scale. The graders for BGS use a 10-point scale to quantify a card's condition, with half-points also used for examples that may fall in-between two levels. Common terms like "Excellent" and "Mint" are used for each step of the scale, though BGS calls cards graded 9.5 "Gem Mint" and uses the term "Pristine" to describe cards graded a perfect 10. BGS considers four different aspects of a card to determine its grade: centering, corners, edges and surface. Once the card's grade is determined, it is sealed inside a hard, tamper-proof plastic holder with a BGS label at the top. 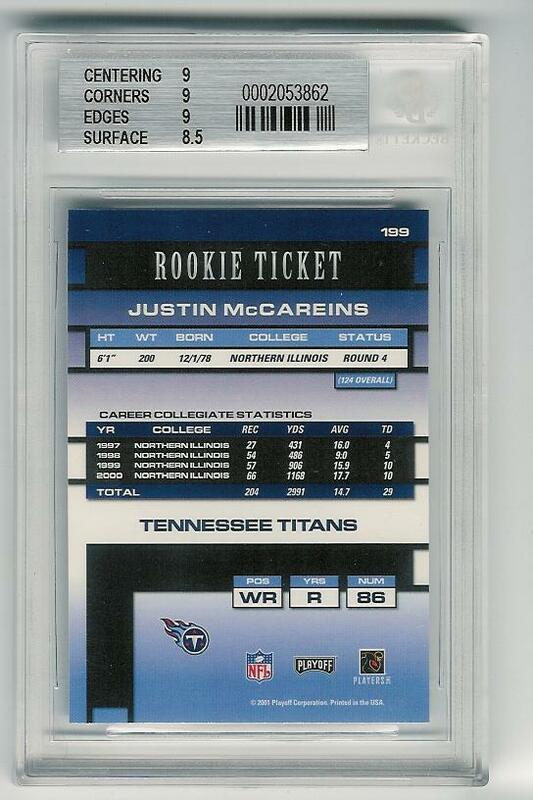 The label has card information and the grade, and is color-coded to make it easier to determine high-graded cards at a glance. The sub-grades for all four grading categories are also given on the rear of the label. Fees for BGS and BVG services vary based on the number of cards submitted and the desired turnaround time. A single card graded in two business days costs $26, while 100-plus cards over 45 business days can be done at $7 per card. BCCG prices can be as low as $2 per card for especially large batches. BGS offers an on-time guarantee for all service levels that refunds the owner's money if the cards aren't graded in the specified time period. Along with submissions mailed to Beckett, BGS also attends many hobby shows to do on-site grading with a slightly different fee structure. Additional BGS offerings include simple authentication (which seals the card in a BGS holder without the grading process), autograph grading and GGUM create-a-card, which adds a small piece of game-used memorabilia for certain athletes to the top of the graded card holder. ALEDMYS DIAZ 2017 TOPPS HERITAGE AUTO RC BGS 10 10 PRISTINE ! !